The question of e-Government has become one of the most important issues on political agendas today, and since the late 1990s, a number of countries have launched e-Government projects, with a particular emphasis on using ICT to provide electronic information and services to citizens and businesses. 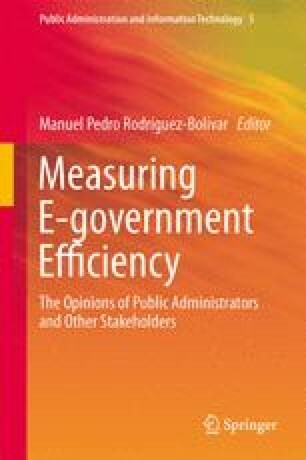 An analysis of literature review indicates that e-Government research has been focused on topics such as enhanced services, streamlined transactions, two-way communication, and greater transparency, but theoretical analysis and practical experiences regarding systems to measure impacts of e-Government implementation on the efficiency of public administrations remain without an appropriated answer nowadays. Therefore, there is a need for analyzing efficiency of e-Government implementations and for knowing the perception of main factors involved in e-Government projects regarding effects of e-Government projects into the efficiency of their work and decision-making processes. This book, structured into three parts, seeks to contribute to the literature by filling the existing void and expanding knowledge in the field of efficiency of e-Government implementations for both public administrations and stakeholders. It provides understanding how e-Government efficiency could be measured and about the reasons why public managers and politicians are undertaking e-Government projects, as well as why stakeholders could be forcing public administrations in order to undertake e-Government projects.